As Americans we tend to worship British culture as something highly refined, tasteful, and perhaps just a little bit snobbish. We tend to think of England and Shakespeare, Shelly, Spencer, Keats, and dozens of other literary masters in the same breath so to speak. While it's true that England and its marvelous language was quite precocious insofar as literature was concerned, well into the 18th century, we would have been hard put to come up with a single outstanding English artist. In the dominant art of painting, England didn't even come close to matching what the French, the Dutch, even the Spanish were doing. In a country were wars and political turmoil came close to matching their French counterparts across the channel, and kings and queens were almost routinely beheaded, the economic conditions for the blossoming of the visual arts were not right until the early 1700s. It was into this world that John Gainsbourgh and his wife took delivery of their fifth of nine children and named him Thomas. The year was 1727. John was a clothier. the Gainsborough house still stands in Sudbury, Suffolk, England, now a museum dedicated to the work of the town's most famous citizen. It is across Gainsborough Street from the Gainsborough Book Store, and not far from a Gainsborough pharmacy, a dry cleaner, a movie theater, a hotel, a guest house, a petroleum company, a silk weaving company and a social club which also bear his name. In school, young Tom was a shrewd but lackluster student. He began his art career drawing pictures of his classmates in return for their doing his homework. At the age of 13 he was sent off to London to apprentice under a silver engraver. But it was painting that came naturally to him, and soon he was being hired to repair old paintings. He hired himself a painting instructor by the name of Francis Hayman who was his only influence as an artist. Hayman also influenced him in the art of drinking and "petticoat reading." His earliest existing painting is one of his dog, Bumper, painted when Tom was 18. 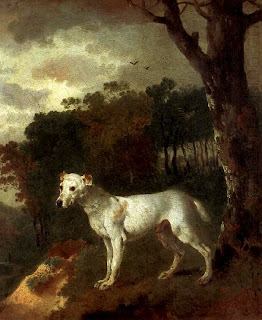 At the age of 19, Thomas Gainsborough met and married a Miss Margaret Burr, a strikingly beautiful young girl believed to have been the illegitimate daughter of the wealthy Duke of Beaufort. With his wife came a dowry in the form of a yearly annuity of two hundred pounds at a time when a skilled artisan usually earned less then fifty pounds a year. 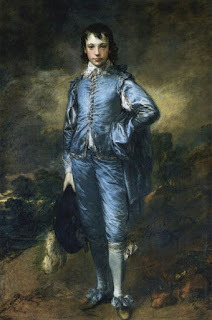 As a result, Gainsborough gained an enviable degree of independence that was to have a marked effect on the work of the amiable, lighthearted, young artist. He could afford to experiment, to improvise, and if the portrait client was too demanding, to turn down the commission. Unlike his artistic rival, Sir Joshua Reynolds, he painted for the love of art, rather than for political or economic purposes. 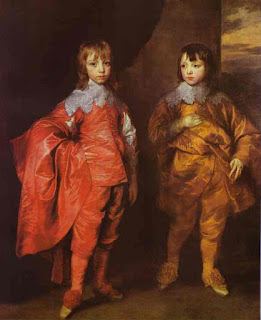 His most famous painting, his Blue Boy, painted in 1770, is loosely based upon a Van Dyck portrait of the Villers brothers, foster sons of Charles II. Preliminary drawings indicate he combined the pose of the two boys into the one in depicting the sensitive, elegantly dressed teenager in his painting. For years the identity of the setter was unknown. It is now believed to be Jonathan Buttal, the son of a rich hardware dealer. They remained friends for life. The young man was one of the few named on a short list of those Gainsborough wished to attend his funeral when he died in 1788.